950 N. Port Washington Rd. 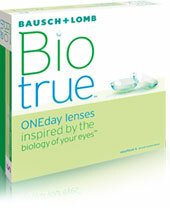 Biotrue ONEday® works like your eyes, for comfortable vision throughout the day ! Finally, a daily disposable lens that matches the moisture level of your eyes to bring you comfortable vision all day long. Your eyes are naturally moist. But as the day wears on, your contact lenses can dry out, leaving your eyes feeling dry and irritated. Surface designed to mimic eye's own healthy tears, so they retain moisture and shape. Same moisture level as the natural eye to support incredible comfort. That's why we are proud to say they are Biotrue is inspired by the biology of your eyes. Because Biotrue ONEday retains moisture, it retains its shape and optical properties. This means that your vision will stay consistently crisp and clear NOT blurry or distorted. And your eyes will feel naturally comfortable throughout the day. Do you ever notice rings around headlights or glare on signs at night? Biotrue ONEday has High Definition Optics, designed to help reduce halos and glare, which means you get great vision in low light as well as in bright sunshine. Your eyes will love NEW Biotrue ONEday. Biotrue ONEday lenses are made from a next generation, bio-inspired material called HyperGel. • Features the same water content as the cornea, 78%, to support incredible comfort. • Allows oxygen to flow freely through the lens, without the need for silicone, delivering oxygen level the open eye needs to maintain healthy, white eyes. A daily disposable lens that matches the moisture level of your eyes to bring you comfortable vision throughout the day. Biotrue ONEday are designed to work like your eyes. This revolutionary lens is inspired by the biology of the eye, matches the moisture level of the eye, and mimics your eye's own healthy tears. All-day comfort, all-distance vision, ALL IN ONE with Bausch + Lomb Biotrue ONEday for Presbyopia daily disposable contact lenses. This revolutionary daily disposable multifocal lens has a 3-Zone Progressive Design™ for clear vision close-up, far away, and everywhere in between. Plus, the breakthrough lens material works like the eye’s own healthy tears to retain the same moisture level as the natural eye – for comfortable vision throughout the day. Due to differences in the curvature of the cornea or lens of the eye, the light has two focal points from two axes often causing blurred near and distance vision. Experience Biotrue ONEday for Astigmatism daily disposable contact lenses for consistently clear vision and comfort throughout the day. Grafton Eye Center is proud to serve Grafton, Saukville, Mequon, Cedarburg, Port Washington, Fredonia, Germantown, Sheboygan, Brown Deer, and West Bend.